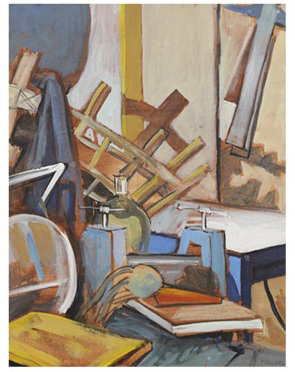 Assignment: Paint still Life of objects from direct observation in oil. Be sure to isolate an area of the setup with a variety of shapes, sizes and placement of your objects. First tone your canvas with a burnt umber base. Then sketch in the composition directly with a brush. Lay in your darks with black or dark brown, and the highlights with white. Then begin to delineate local colors over those tones. Paint in the background first. Then model forms of your subject following lights and darks to give dimension to the forms as they appear. Pay attention to reflected light in shadow areas. Be sure you are using the full spectrum of colors from dark to light, and that you have a wide tonal range. You may let the underpainting reveal throughtout your painting to give a unifying effect, and you may accent areas with line as desired.